Patties Foods, an Australian food manufacturer and owner of the Four’N Twenty brand, has launched a line of hot snacks that are inspired by popular meals. According to a report in Inside FMCG, Patties Foods has released three new varieties of ‘hand-held’ snack that are designed to be eaten on the go: Lasagne, Mac ‘N Cheese and Chicken Cordon Bleu. The products come frozen and are being sold under the Four’N Twenty Toppers brand. 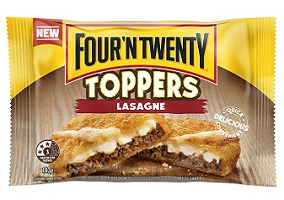 “Four’N Twenty is proud to launch this completely new product to Australia”, Patties Foods said. “We have bridged the gap between a snack and a meal with delicious food on the move. We know Aussies will embrace the Four’N Twenty Topper just as much as they love and cherish all of our creations”. The products are available in single packs of 145g with an RRP of A$2.50 ($1.99).